The historic town of Banska Stiavnica and the technical monuments in its vicinity are an outstanding example of a European medieval mining centre. Central Europe, from the Harz to Slovakia, at that time was the main area for mining and metallurgy. Large scale mining started in Banska Stiavnica in the 12th century, profiting from its location in the middle of an immense caldera created by the collapse of an ancient volcano. From the 15th century on the silver mined here brought great wealth. The city also was the seat of the principal Mining Academy in the Austro-Hungarian Empire. The inscription of this site as a WHS took two tries: in 1992 the proposal was deferred back to the Slovak government in order to gain more information on "the concrete existence of a heritage bearing witness to mining activities". The reply obviously was satisfying, and the site was inscribed in 1993. The tension rises during the 18km approach from the highway to this town. Tiny villages and derelict mining sites (with the appropriate desolate apartment blocks) alternate. Déjà vu: Alaverdi, Armenia (close to the Haghpat WHS). You just wonder what is behind the next corner and what Banska Stiavnica is like. Well: the first view of its valley really makes you want to slam the brakes of the car. Elegant, colourful and many many church spires that dominate the vista. Walking its steep and cobbly streets another déjà vu hits in: Ouro Preto. 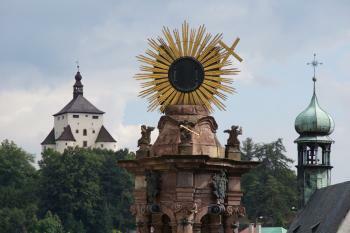 Banska Stiavnica is smaller and less exuberant baroque, but has its Old World charm. And a number of remarkable sights: its shiny plague column of course, but also the pretty New Castle and the Knocking tower which woke the miners every morning. In the late afternoon I decide to check out the Calvary, which lumbers so attractively on a hill just outside town. I go by car, which proves a good choice when I notice the red faces of the hikers that I pass by. You’d better save your breath for the Calvary walk itself. There’s no sign, but when you see the Calvary at its best from the main road, there’s a turn to the left into a small paved road. At the entrance of the Cavalry there is parking space for a couple of cars. The climb along the various chapels to the church at the top takes about half an hour. There are great (Sound of Music-like) views of the surrounding meadows. In all, it’s a worthy WHS. There’s enough to see and do to keep you busy for a full day (or more) and it also is a pleasant place to stay for the night. Beware when preparing a visit on basis of the Unesco Advisory Body documentation: the ICOMOS report on the site isn’t especially flattering and the first referral (in 1992) I think was a disgrace. What I like most about the World Heritage List is that it draws my attention to places I would otherwise never add to my itinerary, and Banska Stiavnica is one of these sites. The main sight and the most enjoyable part of our visit was the town itself, beautifully located in a narrow valley. The town centre has a lot to offer: pretty burgher houses, the Holy Trinity Square with an impressive Plague Column, the Knocking tower (now a cosy tearoom), and several churches. The views are dominated by the two castles. The Old Castle was originally a Romanesque basilica, it was extended in the 16th century to a fortress for the defense against the Turkish raids. The striking New Castle on the opposite hill can be seen from almost anywhere in the town, a real eye-catcher. The photo shows the tip of the Plague Column and the New Castle in the background. You get the best views to the old town and the two castles when you walk along the Vodarenska street north of the town centre, the walk ends at the Vodarenska jezero, the oldest of the artificial water reservoirs around Banska Stiavnica. We also went to the Calvary, the Baroque chapels are arranged symmetrically on the steep slope of a dormant volcano. It is not far from the town centre, but we followed the advice by Els and go by car - a good decision. There were construction works going on, the lower church was already finished, but in the upper church and some of the chapels the restoration is not yet completed (in August 2014). We stayed overnight in Baska Stiavnica. Next morning we headed to the Open-Air Mining Museum about one kilometre south of the town centre. It is the only former mine that is open to visitors. We arrived just in time to join a German guided tour to the Bartolomej pit. The tour starts with a short film on the history of mining in the region, then, equipped with coats, helmets and mine lamps, we walked about 1.5 kilometres through the underground galleries. The entire tour takes about 90 minutes. The mining museum is not a must-see, it is very similar to other mining sites, but I like to visit this kind of WHS and the underground tour was a nice completion of our visit. We visited this site on 10th June 2014 (day 5 in our holiday). As a day trip from Bratislava were we where for holiday. It's like a 1.5h hour drive (with some speeding). 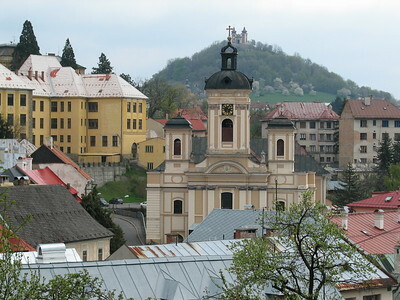 Today it’s time to visit another UNESCO World Heritage Site: Banska Stiavnica. This this a site, like the one above on day 3, which you need the full day to visit. It consists of multiple places starting with the old town, the calvary complex, castles, towers, lakes and the mining sites. We drove from Bratislava about 9 AM arrived there around 11 AM at the Holy Trinity Square and parked the car there. We did breakfast/lunch at a local restaurant. At the end of the day we noticed we should have driven an hour orso earlier as we had to hurry everything and we could not see Castle in Sv. Anton (not part of this UNESCO site but very nice!). We started to check out downtown (in gallery everything is chronologically). Holy Trinity Square which was erected in the 14th to 16th century and has the Holy Trinity Column in the middle and is surrounded by houses of the rich in those times including the mining court. Down the square we walked to the St. Catherine’s Church which is a late gothic church from the end of the 15th Century. For some reason it was locked. From there it’s a short walk to the botanical garden, and the oldest church of the city: Church of the Assumption of the Virgin Mary. From here one can walk to the Kammerhof, now holding a museum about mining. From there we walked up the hill to the old castle which originally was a parish church in the 13th century. It was turned into a fortress during the Turkish invasions and now there is some exhibition, visit the jail and the bell tower. In the old town you find also the Evangelical Church which is a protestant church which Stiavnica was for almost two centuries in the middle of a catholic country. After a short break we visited Bethlehem of Banska Stiavnica (not UNESCO) which is a 21 meter long wooden carved representation of Banska Stiavnica with 800 figures of which half of them can move. We then moved on to see the rest by car, first the new castle. It was a fortress during the time of the Turkish invaders, it now holds a museum about firefighting (we did not visit). From there we drove by the Knocking Tower which now holds a tea house. In the old days miners were called to work by knocking a wooden block and also rebellious miners were imprisoned here. From here we drove to the Calvary which is a cluster of chapels and churches on a steep hill. Built in the 18th century by Jesuits a great unique place which luckily is getting restored. We then drove along the Castle in Sv. Anton; it must have the most beautiful museum in Slovakia but we had no time to go inside. From here we drove (for the kids) the top attraction of the day: Open-Air Mining Museum. You can find several historical buildings above ground, and you can opt for a tour underground. We did the tour which lasted around 90 minutes and is really worth doing as you can see how the mining worked in the past and the present. Then a short 2 hours drive back through the mountain scenery! The buildings along Kammerhofska Street have been restored sympathetically to the originals, as has the New Castle. 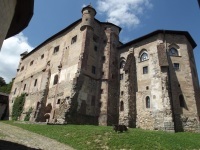 But the Old Castle overlooking the town remains unashamedly unrestored. Transport remains scarce, with only occasional trains from Hronska Dubrava. There are also buses from Banska Bystrica and Zvolen. This historic mining town deep in the mountains of Central Slovakia is an interesting site, but since I didn't have much time, I had to content myself with a quick walk around the main square with the Trinity Column and up to the castle. There is a short mining shaft next to the tourist office that gives you a nice impression of the history's mining area. Getting to Banska Stiavnica by train is not an easy one and requires numerous changes. The upside is that you are travelling through a very varied landscape with both mountain scenery and fields. The town of Banska Stiavnica is located on the slopes of what was once - some 20 million years ago – one of Europe’s biggest volcanos. And as we all know, volcano’s equals mineral deposits and there are evidence that mining took place here as early as the stone age. But in the early 12th century things started to get organised and it all later became the rich town of Banska Stiavnica where the first steps in industrial mining was once taken. Dozens of tons of gold and silver has left the town gates of Banska Stiavnica and the riches were used to erect the town and fund wars. But it was also used to support science, education and culture. The town is filled with numerous beautiful buildings, two castles, churches and – the towns logotype – the Holy Trinity Column – erected in 1711 as a sign of gratitude for the end of the plague. And it was here the first European Mining Academy was founded in the 1760:ies. But in the midst of the 19th century the mines began to dry up and the town slowly went into decay. Today it’s slowly being refurbished and tourists are finding their way to this charming town in southern Slovakia. Don’t miss it if you are in the neighbourhood…. I spent two days and one night in Banska Stiavnice last summer. It was an amazingly friendly and beautiful town. Both the old and new castles are a treat to see, and the old castle hosts a medieval show for families on some evenings. People here were very approachable and interested in talking to tourists. I am 22 and was with some others my age, and we found some nice local nightlife. There is a street with 3 small, crowded discos and an excellent tea house overlooking the town with hookahs (water pipes) and cozy rooms to sit on pillows on the floor with your friends. The hotel we stayed at was named The Chameleon, and it was extremely nice with great breakfast, a leather living room set and TV in most rooms, and heart-shaped gingerbread cookies on our pillows. Definately a worthwhile stop in Slovakia.